This article is part of a year-long feature - watching and blogging about twenty acclaimed, cult, challenging and rare films over the course of 2013. The full list of films (and links to other completed posts) can be found here. At number thirteen, we've got all the time in the world with Jeanne Dielman, 23, Quai du Commerce, 1080 Bruxelle. Over the years, cinema has been required to interpret and invent its own unique senses of space and time. Sound stages, sets, camera angles, perspective tricks, even bloody 3D have all ensured film deals with physical space in an entirely different way to any other medium. Time, too, has had to be reevaluated, trimming away the excess seconds, minutes, hours, days and years that are superfluous to the story being told. In cinema, these two most fundamental of concerns are dynamic, constantly being reinterpreted and remixed to provide us with exhilarating new experiences. How amazing, over a century later, that we're able to tell screen stories, free of the limitations of boring old reality! The fluidity of space and time is the very quirk that, perhaps, defines cinema. Jeanne Dielman, 23, Quai du Commerce, 1080 Bruxelles is one of the most acclaimed experiments with cinematic space and time - an experiment, we could argue, that starts with a title that mocks the usual catchy, marquee friendly film names. It's far from the only manner in which director Chantal Akerman rejects conventional film wisdom and opts to forge her own path. The film perhaps stands out from the crowd most in terms of its approach to time. Of course, it does very much utilise the chronological trickery the medium demands - it needs to in order to compress approximately 48-hours worth of activity into 200 minutes. But aside from that, it hypnotically builds itself on the rhythm, pace and repetition of daily life. Housework is shown in minute detail. The camera lingers, in no rush whatsoever, over Jeanne (Delphine Seyrig) and her moody son Sylvain (Jan Decorte) as they eat dinner and engage in forced smalltalk. As the film enters its 'second day', we see actions repeated, again in militantly obsessive detail. It was neither the first film to focus on slow, undramatic happenings in all their mundane detail (the likes of Andy Warhol with their 'basically nothing happens' short films) and it wasn't the last (Bela Tarr perhaps takes it to even further extremes, both technical and narrative). That's not to mention all those record-breaking 'longest films ever' that request days, if not weeks, of the audience's time (few, of course, accepting the invite). But Jeanne Dielman... is absolutely hypnotic in the way it follows its own pace. The drama comes from the variations that eventually arise in the daily chores - minor at first, but later more significant (the film's psychological breaking point takes place over an unsatisfactory cup of coffee). We've been granted such intimate access to Jeanne's life and at such length that these changes from routine come across as sinister and discomforting. There's barely a word spoken, but Akerman grants us such access to our heroine's minute-by-minute activities that we grow extraordinarily aware of her inner turmoil as her life begins to unravel and drift towards a brief explosion of violence. We get to know Jeanne, basically by just spending time in her company. None of this would have worked without the film's equally compelling sense of space and place. Michael Haneke must surely have been inspired by this film for Amour - Akerman only rarely and briefly allows her camera to leave the eponymous apartment (even then, all we see are a few streets, shops, a bar and a particularly cramped post office). The apartment space itself is quite cramped - one room tripling as bedroom, dining room and living room. This only enhances our claustrophobia and invites the viewer to analyse the influence the home is having on Jeanne. When the camera lingers on a familiar space, we're forced to scan the area in great detail and begin to understand the history and people of the apartment in more depth. The place is littered with clues and items that will come to take on greater meaning later on. But Akerman does grant Jeanne one bit of personal space. When she hosts the male 'clients' she has around every afternoon, the door to her bedroom is closed and the film jumps forward to 'after the act' (it's one of three or four particularly emphasised, loaded edits). It's not as if Akerman or Seyrig are prudes or anything - there is a lengthy, unromanticised bathing scene, after all. No, where the film benefits from this sense of mystery and privacy is when the director opts to finally throw open the door at the end, granting us viewing privileges to Jeanne's final (and murderous) encounter with a male customer. It's a complete narrative suckerpunch, its impact amplified exponentially by Akerman's previous decision to keep that one act secret and mysterious (even though there was never any doubt of what was actually going on behind that closed door). There's much to be written about the film's feminist and allegorical subtexts - there have, after all, been very few films that have cried for individual independence so loud and passionately. 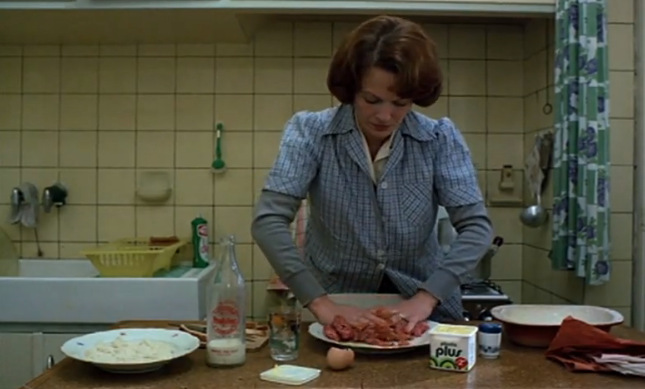 But it's Akerman's peerless control of the film's own temporality and internal dimensions that make Jeanne Dielman, 23, Quai du Commerce, 1080 Bruxelles such a rich experience, and one that still feels as singular as it must have done back in 1975. Clear your schedule and make yourself comfortable: this is an extraordinary journey through cinematic space and time.